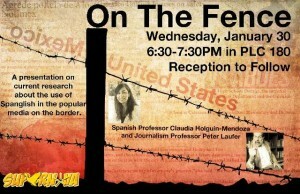 On The Fence: A presentation on current research about the use of Spanglish in the popular media on the US/Mexico border. Wednesday, February 26th from 6:30-7:30 pm in PLC 180. Reception to follow. This event is FREE and open to all!